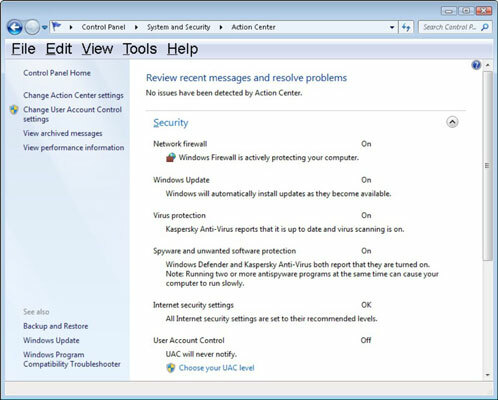 The Action Center is a feature in Windows 7 that monitors various security and maintenance-related items on your computer. It helps you keep your computer up to date and notifies you when there is an issue — without constantly nagging you, as in previous versions of Windows! The Action Center icon appears as a small white flag in the notification area of your system tray (lower-right corner of your Windows desktop, near the clock). If you move your mouse pointer over the Action Center flag without clicking it, a small tooltip pops up, either telling you there are no issues or indicating the number of relatively minor issues, as shown in the following figure. The Action Center tooltip — minor issues. When there’s a security or maintenance issue that requires attention, a small red x appears on the Action Center flag. When an important security or maintenance issue first occurs, in addition to the small red x appearing on the Action Center flag, a notification pops up telling you about the issue — and in some cases allowing you to fix the issue by simply clicking the notification. The Action Center notification for important issues. Windows Update: Microsoft regularly releases updates, fixes, patches, and drivers to the Windows operating system to constantly improve performance and stability, and to address newly discovered security risks. Internet security settings: Internet Explorer security options are monitored by the Action Center. You can change these settings in Internet Explorer by going to the Tools menu and clicking Internet Options. Network firewall: Firewalls are integral to the security of your computer and network. Spyware and related protection: Spyware and adware are ubiquitous on the Internet today, thanks in large part to high-speed home Internet connections. Windows Defender helps protect your computer and network from these security threats. User Account Control: This is where you change your notification settings. Virus protection: Antivirus software remains one of the most basic and important pieces of security software necessary to protect your computer and network. Windows Backup and Restore: Helps you recover your computer and personal files when a virus inevitably wreaks havoc or a newly installed application decides not to play nice. 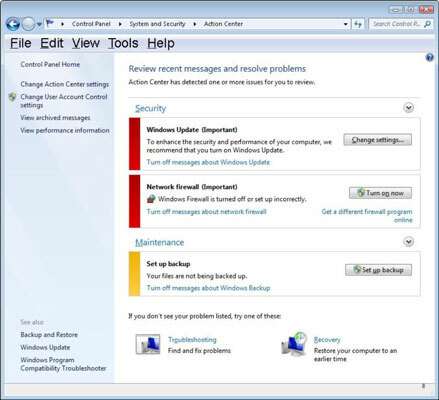 Windows Troubleshooting: Windows 7 has many helpful tools for helping you troubleshoot problems. Check for updates: Windows isn’t the only software that is subject to security patches and bug fixes. This option allows Windows to automatically look for updates to common software such as Microsoft Office. When all is well in Windows, there isn’t much to do in the Action Center. If you open the Action Center, you’ll see the status of various items that it is monitoring, but there aren’t many configuration changes you can make. The Action Center with no issues detected. However, when things are amiss, the Action Center makes it quick and easy for you to fix things. The Action Center identifies problems and indicates their relative importance with a red or yellow bar to the left, as shown in the next figure. In many cases, correcting the issue is as simple as clicking the button to the right of the issue description (for example, turning on Windows Firewall). The Action Center with issues that need attention.